Wildlife ecologist Jeff Buler and doctoral student Solny Adalsteinsson are studying bird movements in forested areas around Newark, Del., as part of their research on ticks that spread Lyme disease. 12:24 p.m., July 17, 2013--Delaware has one of the highest incidence rates of Lyme disease in the United States, according to the Centers for Disease Control. The tick-borne disease can have debilitating consequences in humans, dogs, even cats. University of Delaware scientist Jeffrey Buler aims to see the number of infections decline. “In urban areas, humans face the greatest exposure to infected ticks along forest edges,” says Buler, who is an assistant professor of wildlife ecology in UD’s College of Agriculture and Natural Resources. 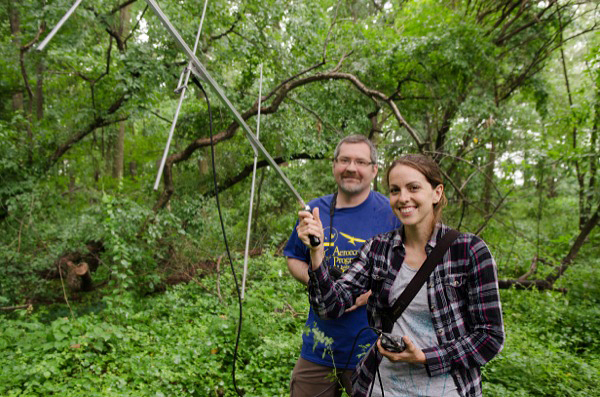 With funding from the University of Delaware Research Foundation (UDRF), Buler will use radio telemetry to track bird movements in a network of 21 fragmented patches of forest in and around Newark, Del. He wants to better understand the role that birds may play in dispersing ticks in these forested areas. UDRF, a private corporation chartered in 1955, awards seed funding on a competitive basis to researchers early in their careers at UD. Twelve UDRF projects have been awarded. Each grant totals $35,000, with UDRF contributing $25,000 toward each grant, which is matched by $5,000 from the Office of the Provost and $5,000 from the researcher’s college dean. A holistic approach to reduce tick-borne diseases in an urban landscape. Wildlife ecologist Jeff Buler and doctoral student Solny Adalsteinsson will study bird movements in 21 forest fragments in and around Newark, Del., to better understand how birds influence tick survival and distribution. This project will contribute to the development of an Integrated Pest Management (IPM) strategy to manage ticks that spread Lyme disease. The effectiveness of urban stormwater retrofitting in reducing nitrogen export. The majority of the U.S. population now lives in urban areas, producing major impacts on water quality. The research goal of Luc Claessens, assistant professor of geography, is to provide a scientific basis for implementing cost-effective approaches for reducing nitrogen export from residential areas through stormwater retrofits and alternative strategies. Impact of land-use activities on pollinators. Deborah Delaney, assistant professor of entomology and wildlife ecology, will survey pollinator communities in northern Delaware to determine pesticide exposure levels in spring-summer 2013 and 2014 during the bloom periods for many trees and shrubs. Exposure risk will be linked with land-use activities such as agriculture, suburban lawns and gardens, roads, parking lots and other impervious surfaces. An ultrafast infrared fluorescence microscope. Lars Gundlach, assistant professor of chemistry and biochemistry, is developing a microscope for measuring infrared emissions from individual nanoparticles with femtosecond time resolution. Such measurements will give unprecedented insight into the dynamics of photo-carriers in materials such as graphene and other promising candidates for infrared imaging applications, nanolasers and thermal photovoltaics. Observing marine debris from space. Although its ecological consequences were first reported in the early 1970s, we do not know how much marine debris is in the ocean today. Young-Heon Jo, assistant professor of oceanography, is working to develop the first practical algorithm to detect marine debris from space, especially large garbage islands such as from the Fukushima tsunami. Bone tissue repair and regeneration. Existing implant materials have serious limitations in physical characteristics and biocompatibility. Arun Kumar, assistant professor of medical laboratory sciences, will explore the development of a new nanocomposite that mimics the structure and characteristics of natural bone for use in implant therapy. Cognitive neuroscience of body representation. After a stroke, brain-damaged individuals demonstrate a variety of deficits related to body perception, from the simple (loss of sensation) to the astonishing (perceiving extra limbs). Jared Medina, assistant professor of psychology, seeks to develop models to understand the functional and neural architecture of sensorimotor representations of the human body, which may aid stroke rehabilitation. Reverse-engineering gene regulatory networks. Differences in protein levels can lead individual cells to different fates. When HIV infects a cell, the virus either kills the cell or becomes dormant. Abhyudai Singh, assistant professor of electrical and computer engineering, is devising mathematical techniques to read the protein variability across cells. The ultimate goal is to reverse-engineer certain interactions between gene and proteins. Textiles with integrated carbon nanotube networks. Erik Thostenson, assistant professor of mechanical engineering and affiliated faculty in materials science and engineering, is developing new textiles by integrating patterned networks of carbon nanotubes with micron-sized fibers using an industrially scalable process. The technique will integrate functions such as energy storage in composite materials, as well as enable the tailoring of electrical properties for devices such as antennas. Exploring plant immortality. Although climate-induced stress has caused plant mortalities worldwide, some plants native to the Baja desert can live over 500 years. Rodrigo Vargas Ramos, assistant professor of plant and soil science, will conduct experiments to understand the physiological mechanisms of resilience of long-lived plants in arid ecosystems, with special emphasis on carbon allocation. Cardiovascular disease in postmenopausal women. Cardiovascular disease is the leading cause of death in women, with postmenopausal women at even greater risk. Megan Wenner, assistant professor of kinesiology and applied physiology, will measure a vasoconstrictor implicated in atherosclerosis (endothelin-1) and the receptors to which it binds to determine their role in impaired vascular function in postmenopausal women. Developing rehabilitation guidelines for patients with total hip arthroplasty. Total hip arthroplasty (THA) is the most common surgical procedure to manage the pain and disability associated with end-stage hip osteoarthritis. Although THA reduces pain, it does not lead to comparable improvements in functional performance. Joseph Zeni Jr., assistant professor of physical therapy, will identify specific impairments that contribute to movement abnormalities after THA to develop rehabilitation guidelines that maximize short- and long-term outcomes.